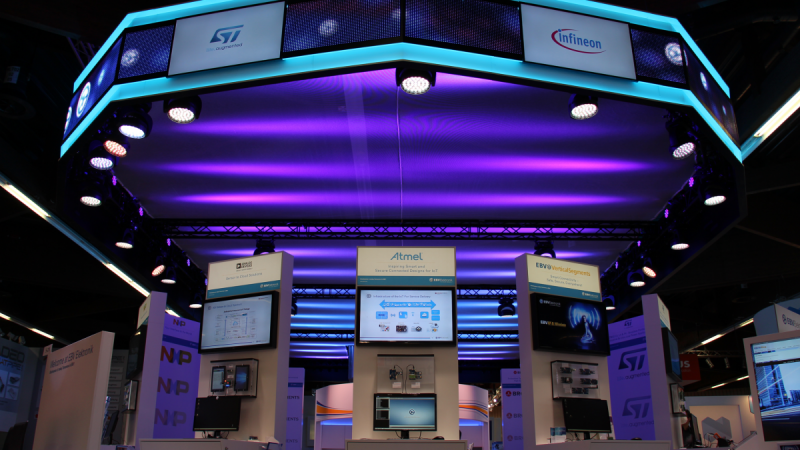 Yeah, by now everyone pretty much knows about STMicroelectronics’s STM32 family of 32‑bit flash microcontrollers based on the ARM® Cortex®‑M processors as well as the great stuff you can do with them by using the resources of the STM32 open development environment (ODE) including the sophisticated STM32 Cube software. 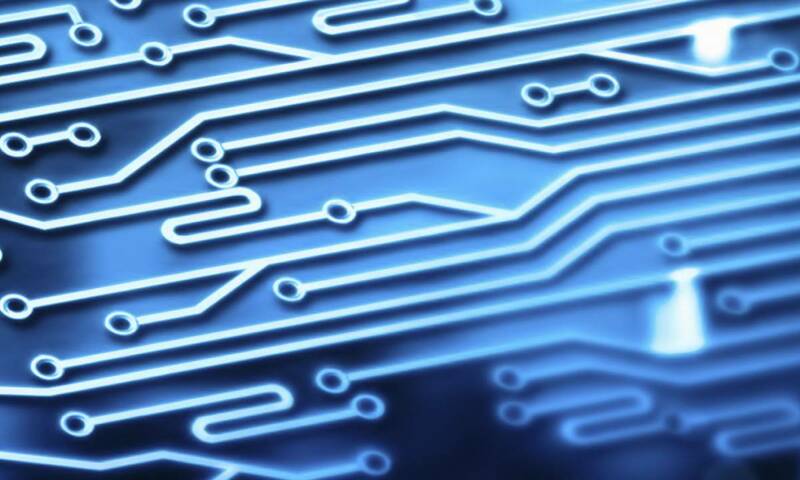 However some recent upgrades to the line-up are worth spending a few minutes to read another story about the versatile MCUs. The first new feature which will be welcomed by many creative makers, engineers and thinkers is the long-awaited Linux and Windows compatibility. With the available high-productivity tools on Linux and Windows platforms STM32 gets interesting for fans of all major software operating systems. 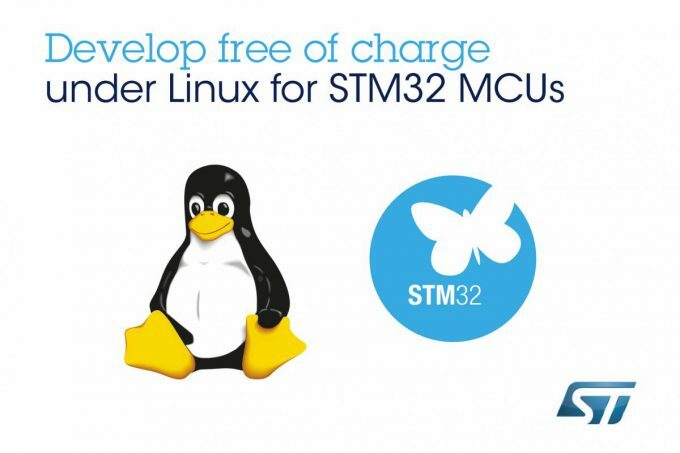 Both, the STM32CubeMX configurator and initialisation tool and the System Workbench® for STM32 (an IDE created by Ac6 Tools) will run on Linux OS. One family member, the STM32L0 series, which represents a combination of an ARM® Cortex®-M0+ core and STM32 ultra-low-power features making this microcontroller a perfect choice for applications operating on battery or supplied by energy harvesting got some great additions with 3 new product lines (Access Line, USB Line with crystal-less USB2.0 Full Speed, and the HMI-ready USB/LCD Line). 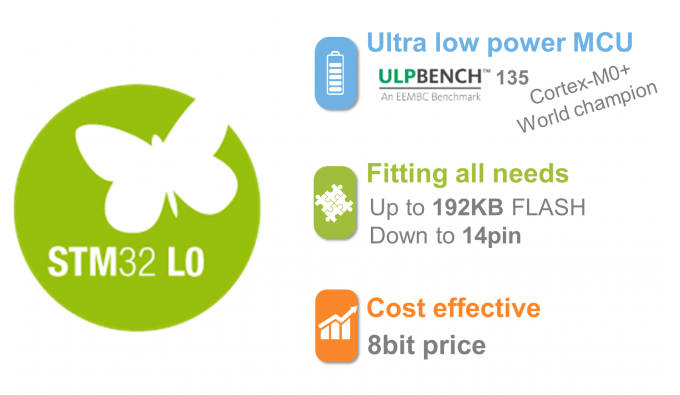 Further the STM32L0 which offers great elements including dynamic voltage scaling, an ultra-low-power clock oscillator, LCD interface, comparator, DAC, true random number generation and hardware encryption (AES-128) achieved class-leading energy efficiency of 135 ULPMark™ -C certified and 158.7 ULPMark -C with a DC/DC converter. Get up to speed on all new features and the new Nucleo board here. 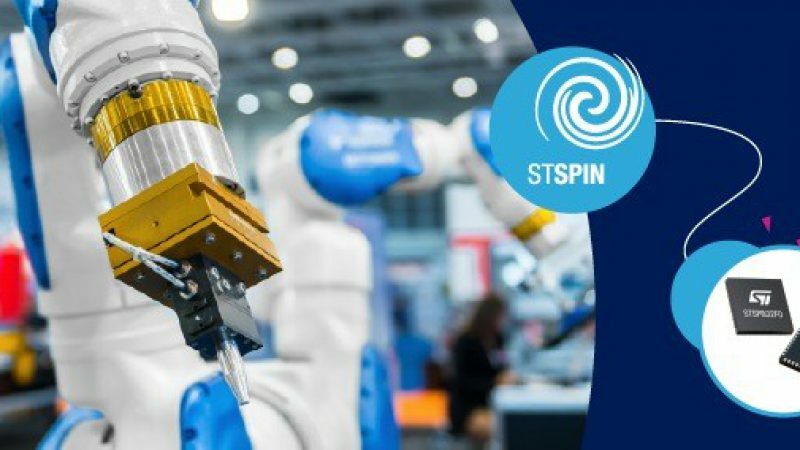 The STM32L4, which has already been proven to be a great fit for a variety of applications including many Industry 4.0 related projects, now got an upgrade on its own with new peripheral and package configurations. Due to smart architectural features such as independently adjustable peripheral supply voltages and a programmable multi-speed internal clock, as well as Batch Acquisition Mode (BAM) and ST’s Adaptive Real-Time Accelerator (ART Accelerator™) the new STM32L4 devices achieve 176.70 ULPMark™-CP1, without the help of a buck converter that adds external components such as a coil and capacitor. 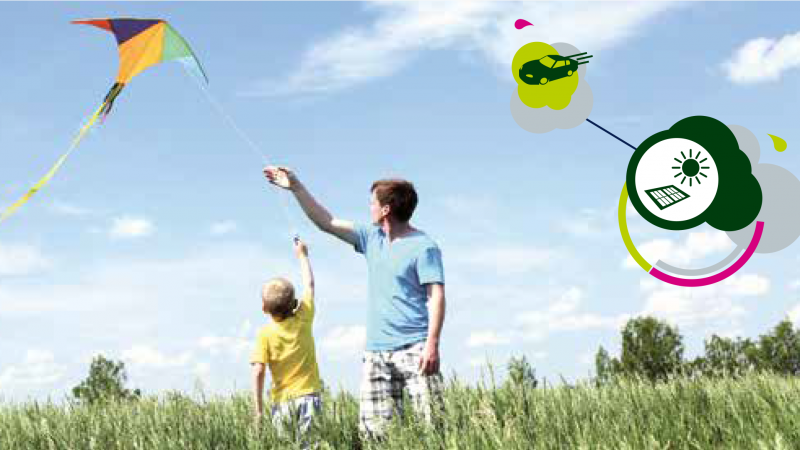 With an EEMBC CoreMark® score of 273.55 at 80MHz and six new STM32L4 lines which offer economy, a range of application-targeted features and extra package choices, designers get a lot more freedom. Checkout the key features of all new devices here. 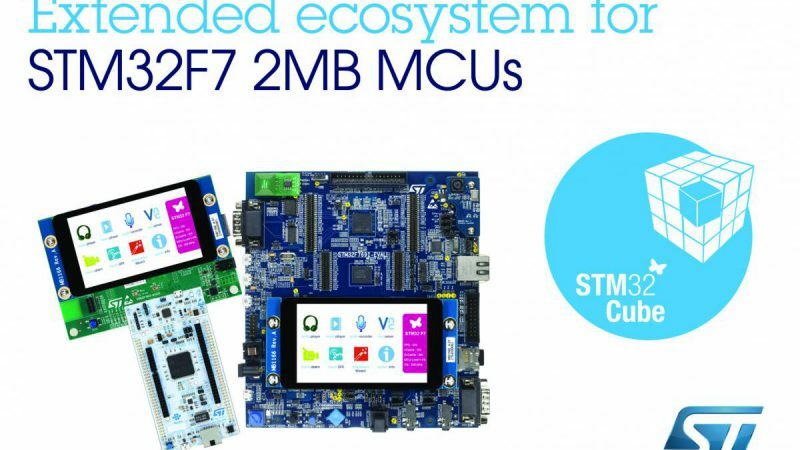 Last but not least there are some great advantages to be found within the STM32F7 system on chip (SoC) ARM® Cortex®-M7 based microcontrollers you might not be aware of. 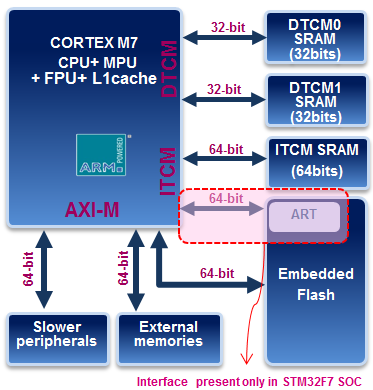 Such MCUs usually share similar ARM®Cortex-M7 processor configuration options including a 64-bit AXI system bus interface, instruction and data cache, 64-bit Instruction Tightly Coupled Memory (ITCM), and dual 32-bit Data Tightly Coupled Memory (DTCM); however there are several features that differentiate the STM32F7 from other Cortex-M7 based microcontrollers, including the equipment with both an ITCM interface and AXI interface to the 2Mbytes embedded flash (see below). Learn more about the full spectrum of features here. To get a deeper understanding of all the new ST features and products swing by the EBV booth at embedded world next week and chat with our experts in order to get started with your own designs.